Oh yeah. This is what freshly-dug sweet potatoes ought to look like. It was the best of sweet potato harvests, it was the worst of sweet potato harvests. 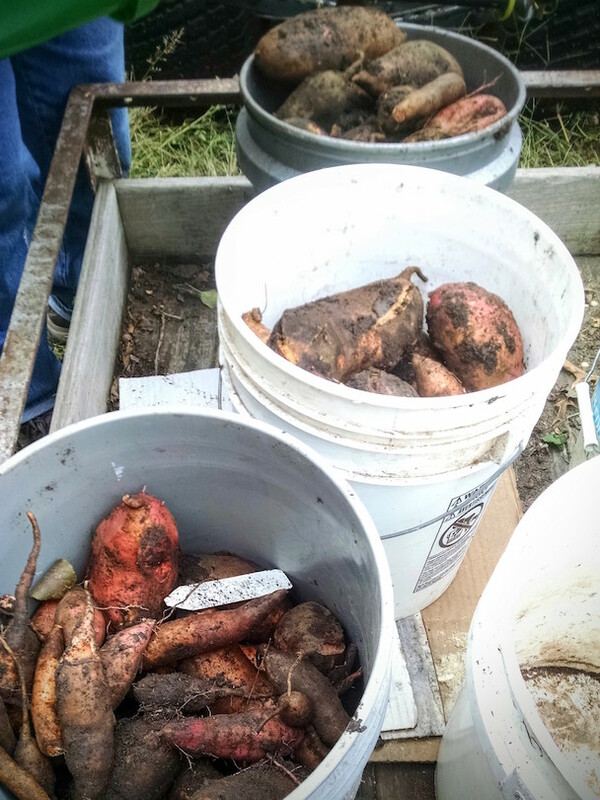 In the span of two days, I was lucky enough to help with two sweet potato harvests: ours, and Mom and Dad’s. One harvest was bountiful and impressive. One harvest was disappointing and comical. Okay, of course you guessed that my folks’ harvest was impressive, and of course you are correct! 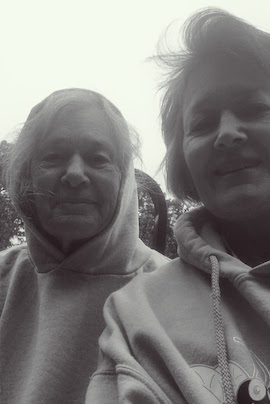 My folks have been around the block a few times, gardening-wise. They are superlative gardeners, both of them. 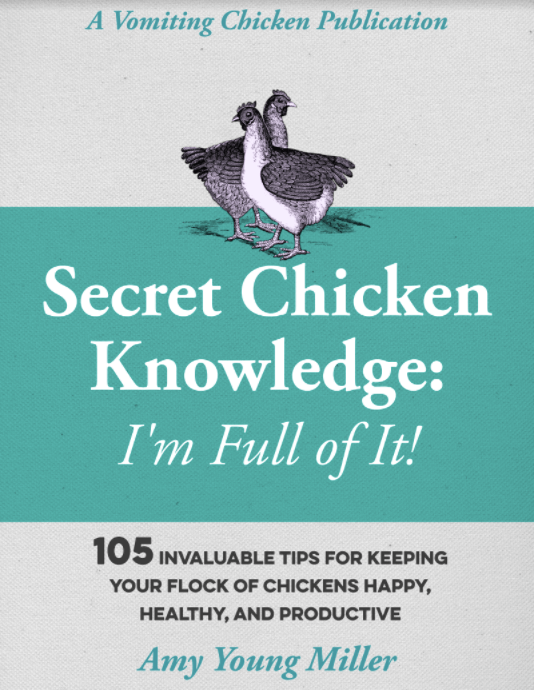 They have their tips and tricks, borne of decades of gardening experience and a real desire to fill up the root cellar every fall. And my dad knows a few things about planting sweet potatoes. My dad knows a few things about everything, truth is. But that’s another post. Or, actually, several. I remember this! In retrospect, that is (sorry Dad) I do remember this. Irish potatoes in a furrow, sweet potatoes in a ridge. Irish potatoes in a furrow, sweet potatoes in a ridge, ee-ii-ee-ii-oh. So this spring, why was I in such a doggone hurry that I forgot about that blessed ridge? I don’t know. I was perhaps cocky about my excellent soil; or maybe Mack was tugging at me to “Mom, come seeeee!” something delightful, or maybe (probably) it was just that I had a to-do list longer than my arm, and building a sweet potato ridge was just not on it that day. “Plant sweet potato slips before they croak” was the item; I did it (quickly!) and went on, tra-laaa. In my defense, at least I did lay out drip tapes. So. I took a picture. Oh, yes, I have no pride. Remember, I planted my sweet potatoes in a furrow. Not correctly in a ridge, as I’ve mentioned. I didn’t take many pictures (usually I take pictures when I am inspired and/or delighted, and I wasn’t either on our sweet potato harvesting), I only took this one. 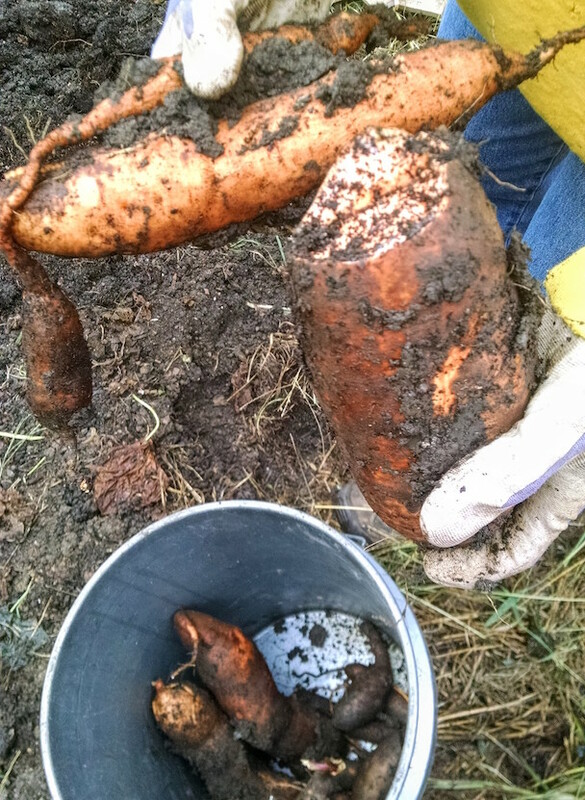 This is NOT what you want your sweet potatoes to look like. 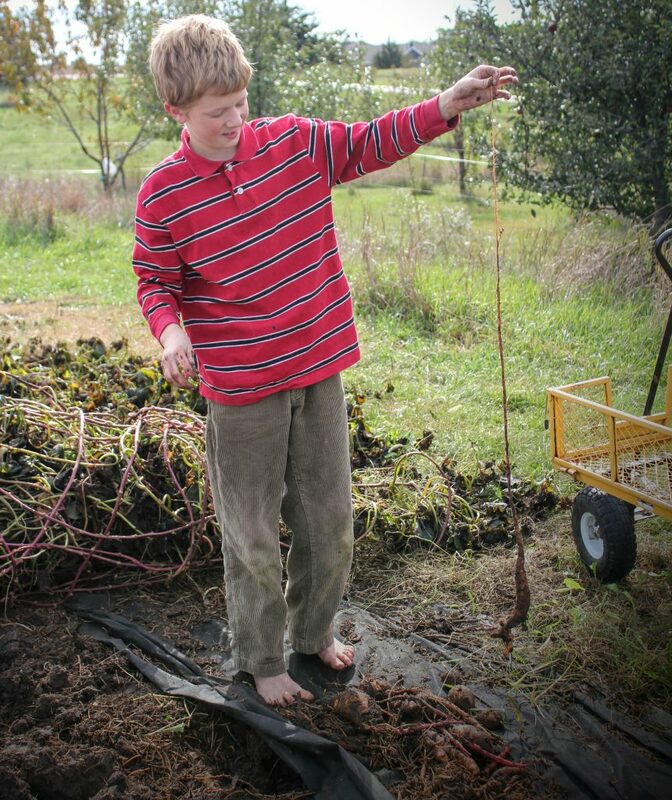 And, children, check out the pathetic little pile of long and skinny sweet potatoes on the ground at Mack’s feet. Truly. Pathetic. I was the luckiest little girl in the world, growing up with the parents I had. Dad is so smart and has such a great memory, that when I would ask him for help with my homework (math, usually) he would pick me up and set me on the kitchen counter or the ping-pong table (it was tough to do when I got to high school) and he’d look at my book, ascertain the answer, and then tell it to me. Then he’d give me a candy bar–no, a banana split!–and send me on my clueless way. I still made it through all my math courses with good grades, but it was by the skin of my teeth, not because of my paying-attention abilities, that’s for sure. I give my Dad an A+ for his patience with me. But. On this one thing, how to plant sweet potatoes, Dad has always cut straight to the answer: plant them in a ridge. This year, he upped his sweet potato planting acumen by doing it one better: his ridge he made out of a mixture of rotted leaves and old sawdust. Can’t you just imagine how ecstatic those sweet potatoes were, growing just as big as they liked, in that friable and soft bed? Streeetching and swelling and grinning to beat the band? Oh yes. You don’t have to just imagine, because I got to be there when Mom and Dad dug them up. (I can assure you that the digging, in their case, went much easier than the digging of our pitiful crop. I was delighted by their harvest, and took plenty of pictures. This is how it’s done: note the clumps of sweet potatoes, which were planted in a ridge. The buckets aren’t just optimistic. We filled them all, mostly. The rotted organic matter made the digging easy-peasy. Pretty big, huh? Dad weighed one of his sweet potatoes: it weighed 4 pounds. This one might have, too, but it broke. 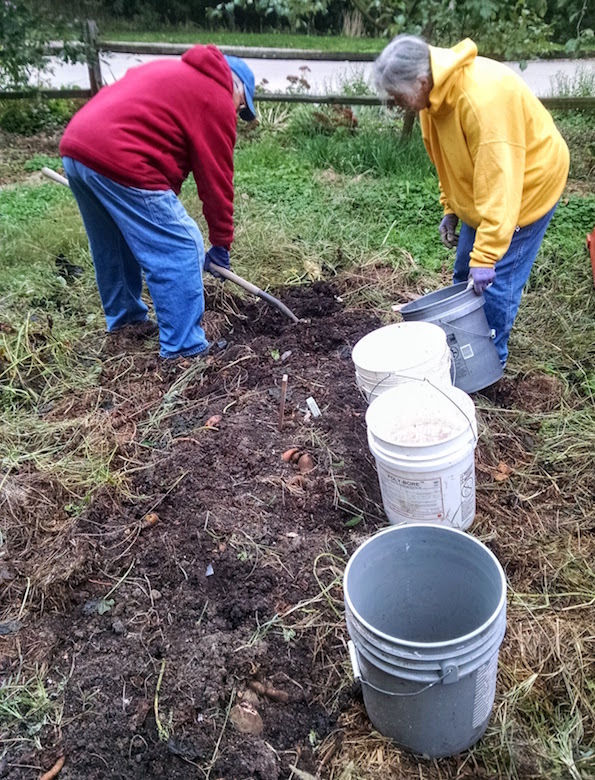 We put the broken or scuffed up potatoes in a separate bucket, to be used immediately. Three buckets nearly filled, one to go! Oh yeah. This is what sweet potatoes ought to look like. That’s it, folks. Now you know. So you don’t forget, you probably ought to save or pin this post for next spring, don’tcha think? Next spring will come before you’re ready for it! By the way, do you have a gardening knife? I didn’t realize how much I needed this until I bought it. It’s now my Absolute Best Friend at harvest time. 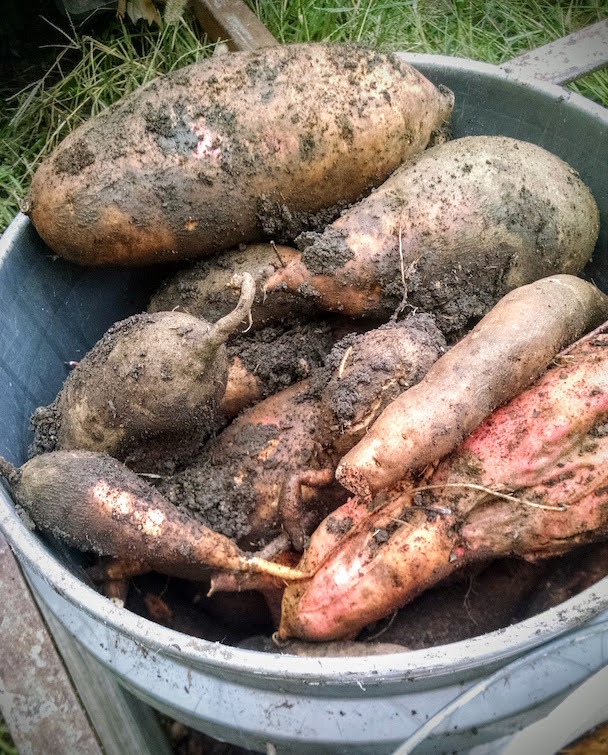 It is so handy to dig around a clump of sweet potatoes, say, or pry at a clump of carrots. Also. If you’re ever threatened by a bear, a crazed weasel, or a starving woodchuck, hey: no worries. You’ve got this. Mack is so jealous of that knife. Just sayin’. 🙂 I tell him that you’ve got to be a gardener to have the best knives. I can’t believe you would even think of blaming your son because you did not remember how to plant sweet potatoes, Oh the shame, the shame….I bet you even asked your dad if you could have the bucket of broken potatoes….and because you seem to forget the little details, now would be a good time to ask your mother to please bring the sweet potato pie to the thanksgiving dinner……and perhaps some baked candied sweet potatoes as well…might as well do it now while it is fresh in your mind……. Would planting in a ridge be comparable to planting in a raised garden bed? And where do you get your sweet potato slips here in Nebraska? in water in February and watch the little slips grow. Thanks Esther. Yes, we bought our sweet potato plants from the local garden center. Also you can take cuttings from your own sweet potato vines in the fall, and then plant them into pots yourself, though that is a long time to babysit sweet potato plants! I’ve done it all three ways. 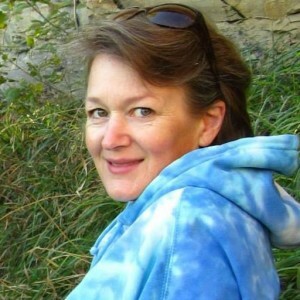 Angie, I think so, as long as the dirt in the raised bed was loose and crumbly, like you want all your garden soil to be. Can you show a picture example of a ridge versus a furrow? Candice, I don’t have a picture but I can do the next best thing and explain it to you. Think of a “ridge” as a hill (a long hill) and a “furrow” as a valley. That’s it! Happy planting! That picture with Malachi next to the pile of skinny sweet potatoes made me laugh, and laugh! I am sure they were still delicious! I loved this article. Oh the wisdom of our parents!! I realized the other day when my son and 16 year old Granddaughter stopped by and I was in the middle of a yukky bumblefoot surgery, that I’m turning into my Aunt Nona ( my mothers sister). My son, bless him, brought this up when I handed him the drippy footed chicken to hold for me. However my sweet Granddaughter watched for a moment then declared , “Oh for Petes Sake gimme that!” She completed the surgery neatly and wrapped the foot handily. A real chip off the Ol’Family Block! My son said he may never eat crab cheese wontons again. Sissy!! We plant both kinds of potatoes on the ridge. So much easier to harvest. Still have cabbage, brussel sprouts, leeks, carrots, rutabagas, kale, swiss chard, and various herbs in the garden. They’re still growing and it hasn’t started snowing! I’m glad I’m not the only person who had a fail on their sweet potatoes (weeds was the culprit)! I feel better…but, buuutttt, I was planting some lettuce in another part of the garden (BTE) and found a leftover vine from a volunteer that we had and pulled on it and it broke from something big. Went to investigate and it was a MASSIVE sweet potato. It weighed in a wopping five pounds! It’ll feed all of us for Thanksgiving! THAT sweet potato was in the BTE garden. The others were not. Case closed! Happy Fall Gardening! Whoa, Rose, 5 lbs!! That’s enough for the entire Thanksgiving candied sweet potato dish!